The communication between all of the above bones develops 3 types of joints, but the term ‘shoulder joint’ usually refers to one joint type and that is ‘Glenohumeral Joint’. This is a major type of joint and the second most important type which you can include in this category known as Acromioclavicular Joint. When we talk about the human shoulder joint, it refers to the area of the body where the humerus (the long bone in the arm of humans extending from shoulder to the elbow) is attached to scapula. It is not just a joint or muscle, but it is actually a group of various structures in joint region. It is themain joint with a ball & socket and it facilitates free rotation of the arm in a fashioned circulation. The articulation between lateral scapula and the humerus head form the Glenohumeral Joint. Humerous’s anterior surface which is medial and rounded called “ball” while the lateral scapula’s dish shaped portion is known as socket. An important wind bone which is also known as scapula acromion. The place where Acromion gets connected with collar bone is the place where acromioclavicular joint is formed. This area usually has a bump which may be small or large in size. Same like the other joints in the body, the AC joint also has cartilage disk inside & at the ends of the bones. The AC joint is supported by capsule and the position of clavicle is managed properly with the help of 2 ligaments which are called coracoclavicular ligaments. The sternoclavicular joint is found between the clavicle end and clavicular notch of the manubrium of the sternum. This joint facilitates the movement of clavicle, mostly in anteroposterior and perpendicular planes. This joint must be in good health to enable arm to thrust and shoulder to forward. 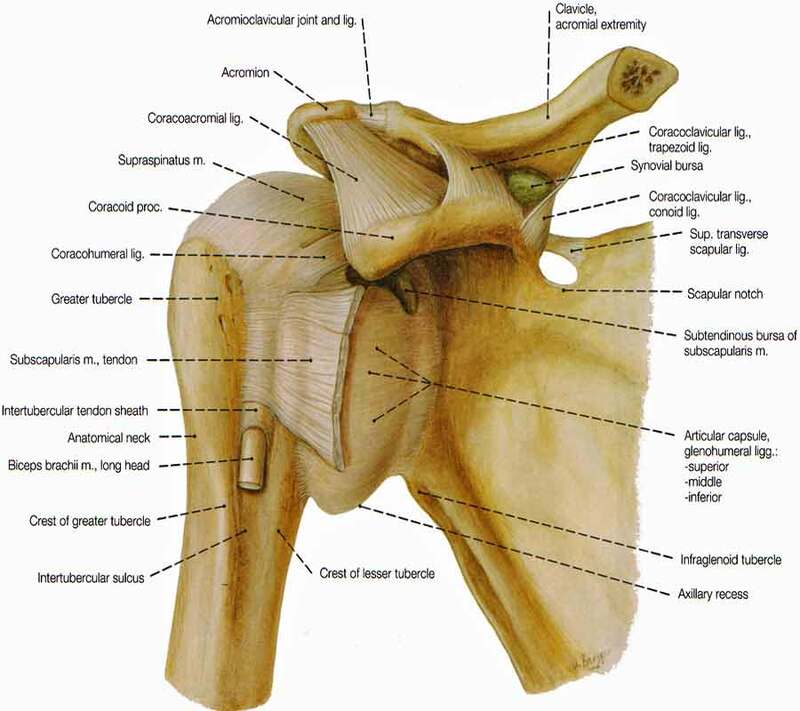 The shoulder joints have cartilages which can be divided into 2 types because of their different functions. This is the first type of cartilage found at the ending points of the bones. They are white in color and facilitates the bones to move and glide over each other. Articular cartilage may also be affected with arthritis and in this case the joint becomes stiff and painful. This is the second type of cartilage which is found around the joint sockets. Unlike, the articular cartilage, this type is much more stringy or inflexible. The joints and muscles let this organ make a number of motions in different ranges and because the arm and shoulder keep moving continuously, this fact makes these joints the most movable joints in human body. This body part has the ability to abduct, adduct, rise, rotate, move forward, move back and make a 360° move in sagittal plane. This incredible variety of movements proves that it is the most unstable body part. However, this ability also puts it to get more injuries. In such a case, the inflammation occurs which might be quite stiff and painful. If this condition is not treated in time, its progress limits the movements. Rheumatoid is basically a form of arthritis which may be quite dangerous as in this condition, the immune system assaults the joints. The result of rheumatoid may come in form of pain and inflammation. Rheumatoid arthritis is fully capable to target any of the joints which also include shoulder. With growing age, the ‘wear-and-tear’ arthritis develops which is quite common and the risk of osteoarthritis development also increases with the age and in this case, the pain as well as physical limitations can occur. However, there are various injuries such as the one is dislocated shoulder which can cause the development of osteoarthritis at any age. Rotator Cuff Tear may be developed in tear which is a muscle that covers the top area of humerus. The condition may be caused by a sudden injury. Gout is another form of arthritis in which the patient might feel pain and inflammation because of crystals that are formed in the joints. However, this is not very common for shoulder area. In this case, the humerus or some other bone found may leave their position and this abnormal activity can cause pain and prevent arm rising freely. A sudden accident or overuse might create tears in labrum which is the cartilage cuff and covers the head of humerus. However, in most of the cases, the labral tears are healed without surgical treatment.